Biomarkers in Alzheimer’s Disease provides a comprehensive overview of all modalities of Alzheimer’s disease biomarkers, including neuroimaging, cerebrospinal fluid, genomic, and peripheral systems. 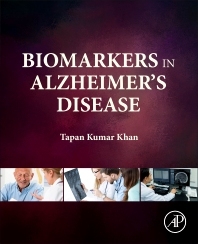 Each chapter integrates molecular/cellular abnormality due to Alzheimer’s disease and technological advancement of biomarkers techniques. The book is ideal for clinical neuroscience and molecular/cellular neuroscience researchers, psychiatrists, and allied healthcare practitioners involved in the diagnosis and management of patients with cognitive impairment and Alzheimer’s disease, and for differential diagnosis of Alzheimer’s disease with other non-Alzheimer’s dementia. Dr. Khan is an Associate Professor at the Blanchette Rockefeller Neurosciences Institute (BRNI). BRNI is operated in alliance with West Virginia University in Morgantown, USA. Dr. Khan has more than a decade of research experience in the Alzheimer’s disease research area. He is an Associate Editor for Journal of Alzheimer’s Disease and is a regular reviewer for many journals including: European Journal of Pharmaceutical Sciences, Bioorganic & Medicinal Chemistry, CNS & Neurological Disorders-Drug Targets, Neuropeptides, Journal of Biomolecular Structure & Dynamics, Stem Cell Research & Therapy.